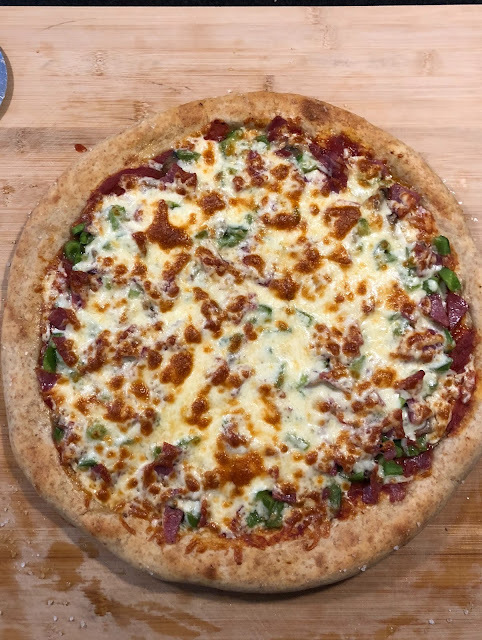 On Friday, Dave made some lovely pizzas for our supper. I love takeout pizza too but nothing beats a homemade one. After supper we played some Quirkle. First I played with E and then when I took Q down for a bath Dave took my spot. On Saturday morning I was up bright and early to go to my workout class for 7:30. This is me when I got home with some red cheeks. I thought about making my regular bagel and cream cheese but then decided to make a healthier choice and went with oatmeal with grated apple, chopped figs, and cinnamon. It was so delicious. E had a playdate with one of his friends in the morning so Dave dropped him off there. After Q woke up we went to do some errands and we stopped at the playground on the way home. After some lunch and Q went for another nap. I took E to a birthday party. Then Dave and I watched Baywatch and I had a this snack of apple drizzled with peanut butter (warmed up to make it easier to drizzle) and sprinkled with coconut, hemp hearts, and cacao nibs. This was the entertainment at the party - a video game truck!! Then we all piled in the car to have dinner at our friend Janna's house. I love her warm and comfortable condo. We had a delicious meal and great visit. And we had brought some cupcakes from Bake Sale for dessert. After we got home Dave and I watched The Shape of Water. It was good but I think I liked some of the other Best Picture nominees better, but I guess since it was different it attracted the votes. And it was made in Canada so I am not complaining about that! We went to church and E made soft pretzels there. Pretzels are actually a Lenten food. They were made in the shape of someone crossing their arms in front of them in prayer, and they were created by a monk during Lent when people were fasting from dairy, meat, leaven bread, etc. I cut mine in half and made it into a sandwich. For the rest of the afternoon we didn't do too much but relaxed and then I got some groceries. I made this delicious salad for our supper from the Oh She Glows Everyday cookbook. The almond butter sauce makes it, she wasn't joking when she said you could eat it by the spoonful. After supper E wanted to play a game on the iPad but I told him he had to do something else first so he set about making a picture by cutting out pieces of construction paper, so I thought that was a good idea. A few stories for before bed. I finished my evening with candlelight yoga. What a treat that was!